First things first: Airbus says that what you're looking at below is conceptual in nature and that it often seeks patent approval to protect its ideas in case of future use. No pun intended, but this one might not fly. 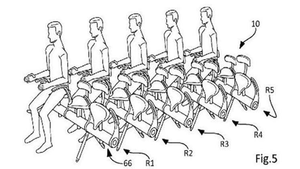 The airplane manufacturer is seeking a patent for what it calls a "seating device comprising a forward-foldable backrest," but what in reality looks like a traditional bicycle seat set up and connected by a vertical bar. In fact, it looks a lot like something out of ancient times when dozens of oarsmen were seated uncomfortably next to each other and forced to row the boat. Yes, we have officially arrived at the "what will they think of next?" point in the airline industry. In its patent application, Airbus described it as "a seating device with reduced bulk, for an example for an aircraft." As if the shrinking space for your keister isn’t diminishing more and more each year, the company acknowledges that "Reduced comfort remains tolerable for the passengers in as much as the flight lasts only one or a few hours." What wasn’t said in the patent application is that using this type of seating cuts down on the bulk in the plane, increases the number of passengers in the cabin and, voila!, increases the number of tickets purchased per flight. Hmmm. Wasn’t it less than a year ago that Airbus advocated for bigger seats?